When is the last time you cleaned your room? When is the last time you washed your hands? It’s probably something that you haven’t really thought about much. What is the difference in English? We actually get questions all the time between the word “wash” and the word “clean”. How do you use them and are they really the same? We’ll show you how to use both words in today’s episode. What is the difference between wash and clean? This is a common question and something that many English learners struggle with. Though they both have similar meanings, they are actually quite different in their usage. So let’s break this down to make it a bit easier to understand. When you see each word and it’s meaning, then it may make more sense. “Wash” is a type of cleaning focused on water, and it usually involves water in some way. Think of certain examples that help this to really make sense. When you wash your hands, you are cleaning them. 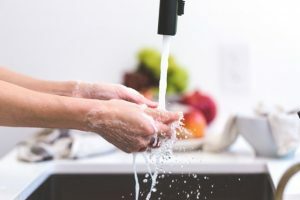 Most people would say “wash your hands” when they are focusing on the sink, but “clean your hands” if you have something on them and need to use a napkin. So that small distinction helps you to see the different ways they are used. Click here to save 50% and subscribe to future transcripts! You wouldn’t say “clean” in any of these examples, so you see how you can naturally use the word “wash” and it’s appropriate. So you see that “clean” is often to get rid of a mess, but not with water. Clean is used as an adjective as well–so you might say that the room is clean. It means that it’s tidy, neat, and pulled together. These all tie into the word “clean” and are part of what makes a room or an area clean. Though the words “clean” and “wash” can sound similar, there are differences. Think of how you can use them in context to make connections. It’s a subtle difference but if you can remember that “wash” is with water and “clean” is not, then you’ll be all set. Once you try it out once you will see that it’s not that difficult and it all relates to things being neat, tidy, and looking good. Go out and try to use these two words in English. This is how you move to the next level in English. Good luck and let us know how to it goes.